Our laser etched black granite headstones are timeless monuments with a lifetime guarantee, with a life expectancy of 500+ years (based on the erosion of granite). We can only laser into premium black granite for the best possible outcome. Laser Etching can do so much more than traditional engraving, it can incorporate scenes, hobbies and special items, leaving more than just inscription. It is true what people say, “a picture tells a thousand words”. Forever Shining wants to help leave a lasting memory that lets future generations know their family history and who they are/were. The laser etching process allows us to etch beautiful, complex and intricate artwork such as calligraphy fonts, logos and photos into the surface of the black granite. Forever Shining has an intricate laser that allows images to look photographic quality on granite. Laser Etching to a huge scale of 2400mm x 1200mm, allowing images to go the size of the monument at no extra cost. Memorials can take approx 10-14 weeks for production*. 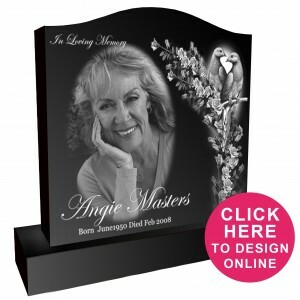 We do carry premium black granite stock headstones in various shapes and sizes to allow for a quicker turnaround time. Headstones can be supplied with or without a granite base. Optional extra includes flower vase holders. As a customer you have the opportunity to personalise the design of your headstone using the exclusive design section of our website. Within this very simple design system, you start by selecting the preferred headstone shape and size, and drafting your personalized inscription with a choice of fonts. All cemeteries Australia wide have different requirements and limitations on headstones allowed in the cemetery. Laser Etched Headstones meet Australian Standards, using premium materials with a longevity of 99 years. There is no reason why a Forever Shining laser etched black granite headstone cannot be installed in any cemetery. Before an order is placed you must check with your cemetery to see if the headstone meets their criteria. Forever Shining works with cemeteries and Installers Australia wide so if you are unsure please contact us prior to purchasing. 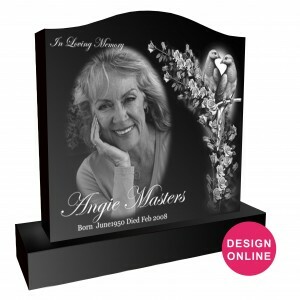 A personalised laser-etched black granite headstone is a lasting memorial with a lifetime guarantee, but with a life expectancy of 500 plus years, based on the erosion of granite. This will give loved ones and future generations to visit the cemetery to reflect on and remember the life of the deceased.